Spring arrives next week, but this week still looks like winter in Washington. 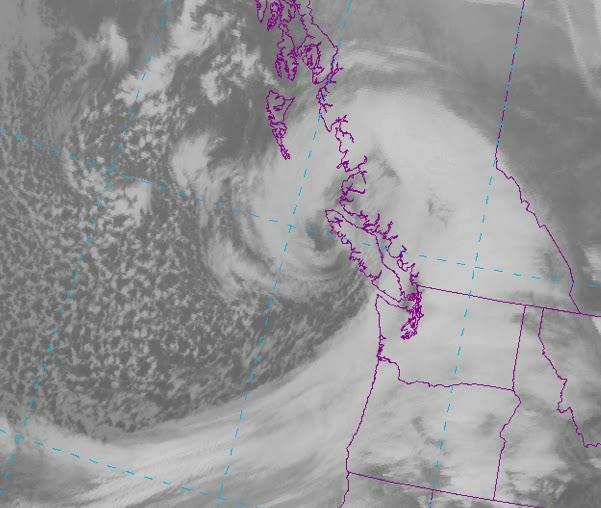 The National Weather Service says a front moving through the state Monday is bringing strong winds and rain to Western Washington, heavy snow to the Cascades and snow in much of north central and northeast Washington. 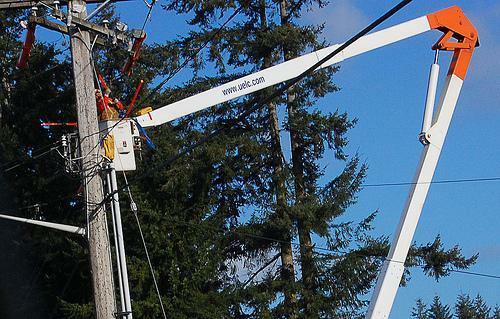 High winds knocked out power for tens of thousands of people in northwest Oregon and western Washington on Monday. It's official now. The January snow and ice storm was a disaster! President Barack Obama has declared a major disaster exists in 11 Washington counties that were hard hit by the storm during the period of January 14-23, 2012. Preliminary estimates indicate more than $32 million in eligible damages. 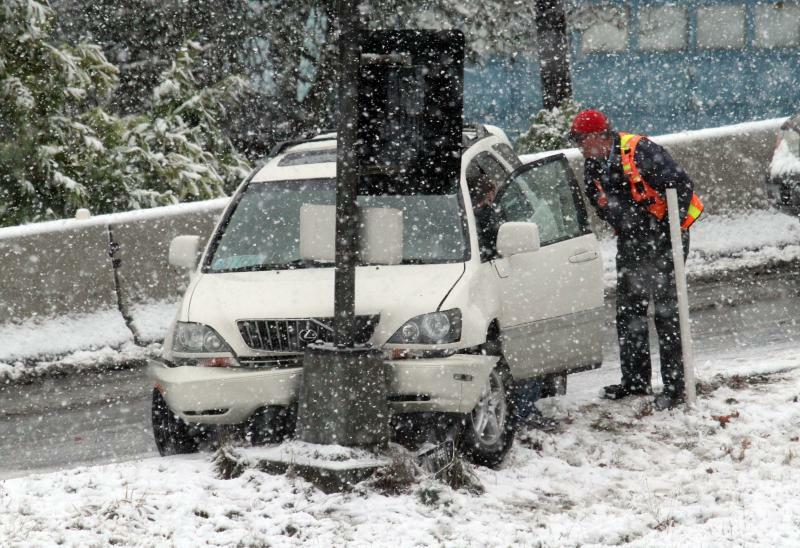 During the January snow and ice storm, Seattle officials told commuters to stay off the roadways. 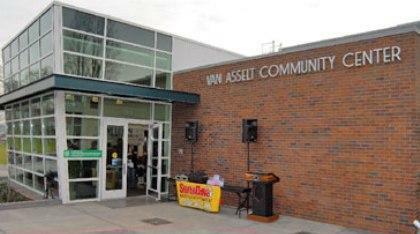 But the message caused confusion among the city’s own employees. OLYMPIA, Wash. — Gov. 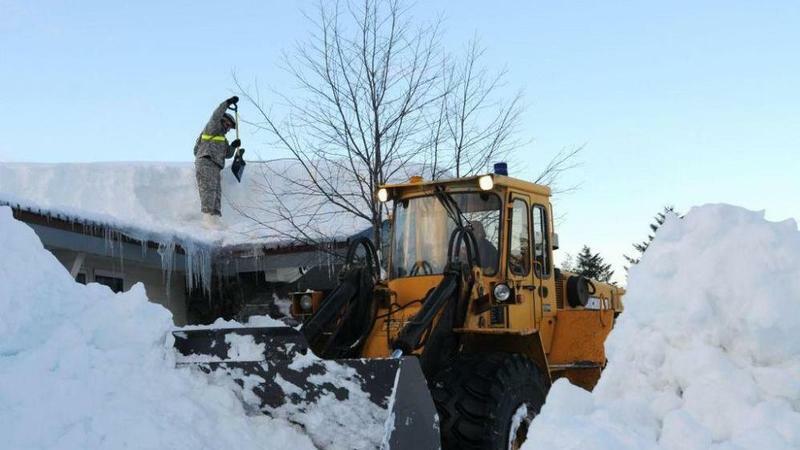 Chris Gregoire has asked President Barack Obama to declare a federal disaster area in 11 Washington counties for damages and costs suffered during January's snowstorm. 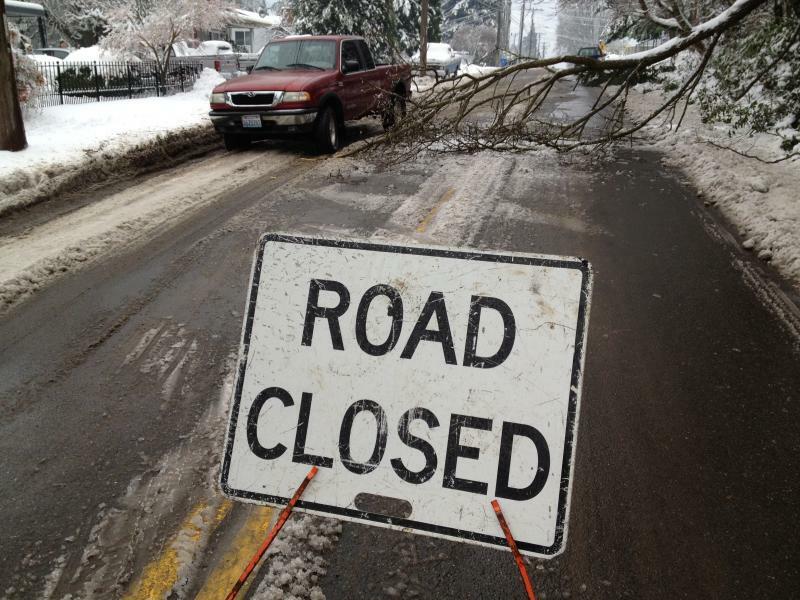 Last month's storm of snow, ice and freezing rain caused power outages, landslides, avalanches and fallen trees across Washington, creating $32.3 million in potential eligible damages, according to preliminary state and federal assessments. If you or your business suffered uninsured property damage due to our recent snow and ice storm, county officials want to hear from you. Public assistance may be available, and the first step is to submit a damage report. 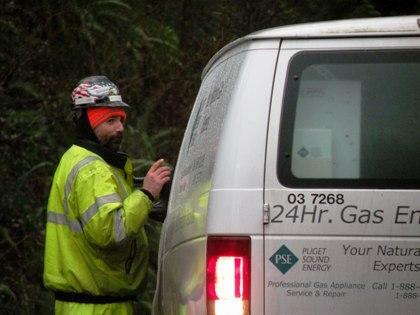 Puget Sound Energy crews working to restore power say they haven't slept much. On Tuesday afternoon, Rob Brackman, who was redirecting traffic while other workers strung new power lines near Dash Point Road and Redondo Way, said he'd had just 15 hours of sleep since Friday morning. But, he says he's been overwhelmed by the kindness of strangers. "We get a lot of joyous people when we get into their neighborhood. They're so happy to see us. People have been bringing us coffee and donuts. It's been very nice," he said. While cities west of the Cascades recover from the ice storm, flooding and mudslides, the Inland Northwest is getting more of what residents have been expecting for a while: a wintry white layer of snow. And forecasters say there's another round on the way. OLYMPIA, Wash. — The massive snow and freezing rain storm that pummeled the Pacific Northwest has caused a power outage at Gov. Chris Gregoire's office, legislative buildings and other state agencies in Olympia. As snow and ice melt on Seattle streets, the city is asking residents to clear storm drains of slush and debris to help prevent urban flooding. More than 250,000 people are without power and all modes of transportation are still a mess, but “this snow/sleet/freezing rain event is basically done,” reports KPLU weather expert Cliff Mass. CENTRALIA, Wash. — The Washington Department of Transportation had closed both directions of Interstate 5 for about 8 miles north of Centralia because of power lines on the roadway. The roadway has been cleared. Gov. 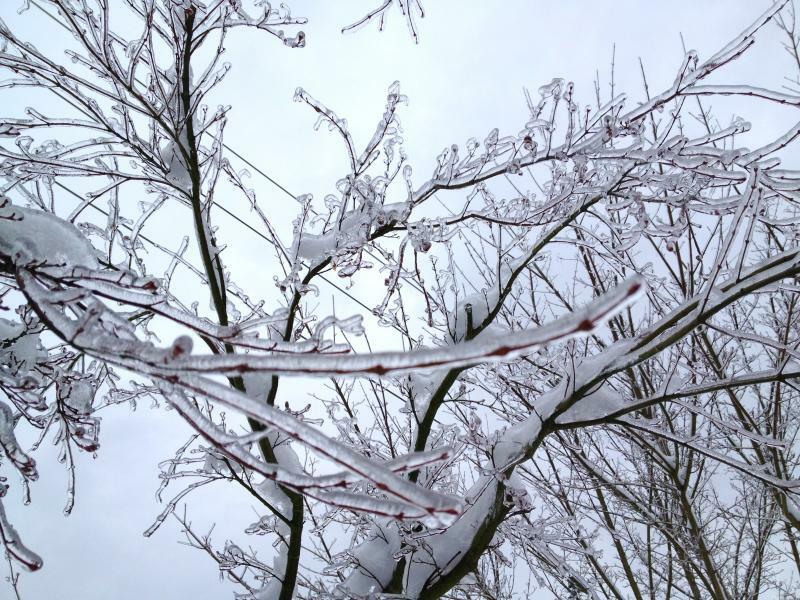 Chris Gregoire has declared a state of emergency for an ice storm that landed on top of heavy snow in western Washington, causing treacherous travel, power outages and threats that buildings could collapse. So far, the storm has left more than 200,000 people without power. Seattle city officials are asking residents to get home before dark, if possible, because they fear even worse icing conditions by night fall. Ice closed Sea-Tac Airport in the early morning before one runway was reopened. The State Patrol said it had responded to about 2,300 accidents in a 24-hour period ending at 9 a.m. Thursday, roughly quadruple the average number. 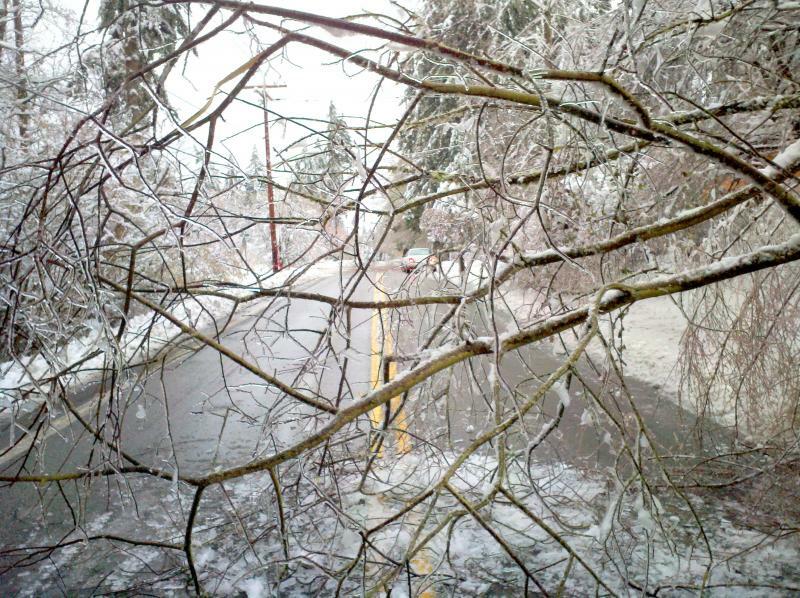 OLYMPIA, Wash. – In Olympia, snow and ice-laden tree branches are down on the capitol campus. On the west side of town, downed power lines made several roads impassable. 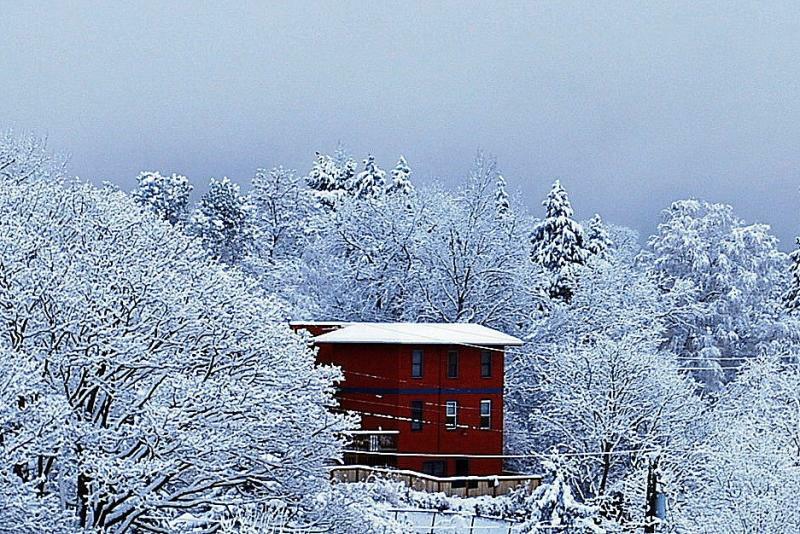 For the record: Share your snow photos! 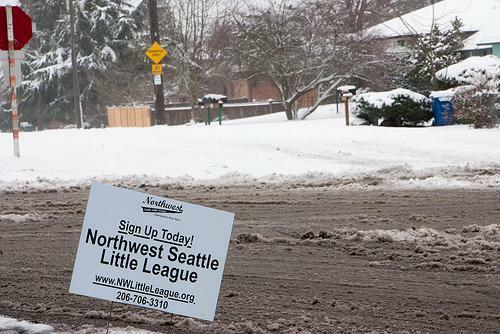 With snow still on the ground in Seattle, we thought it would be fun to share our snapshots of the scene. We'd love to see yours. You can post them and your thoughts in the comments section of this post. PORTLAND, Ore. — Amtrak says it's suspending service between Portland and Seattle because of bad weather. 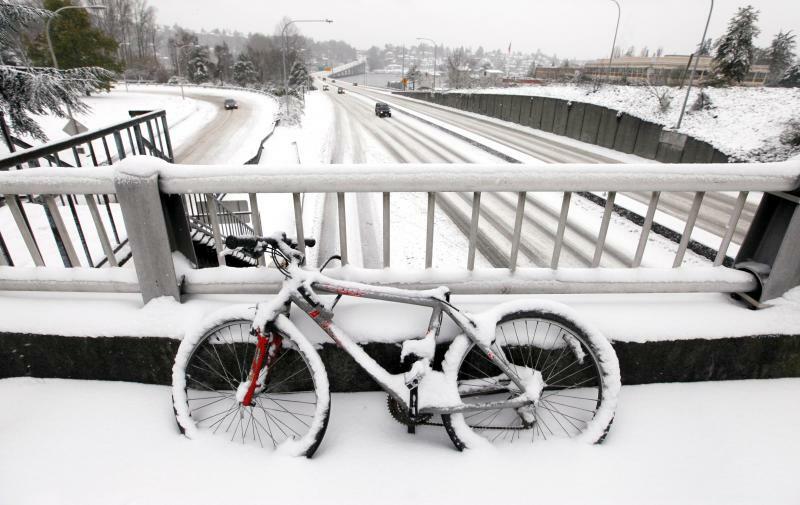 The LA Times ran a story yesterday that accused Seattle of being "snow wimps." So we decided to take a look at what else people on the Web are saying about Seattle folks in the snow, both from around the country and here in Seattle. It’s a tough commute out there for anyone who has to drive. Snow is melting fast, and ice is a big danger. But in Seattle at least, the consensus seems to be that the city has improved a lot in keeping main arterials clear, by deploying trucks that preemptively spray de-icer and sprinkle rock salt on the roads when it snows. It’s not without environmental risks, but officials say they’re doing what they can to strike the balance between maintaining public safety and limiting the risks from polluted runoff. KPLU staff share their observations of wandering through the snow storm in Seattle. PARKLAND, Wash. — The weight of Wednesday's snow on the roof apparently caused cracks to appear in the ceiling of the building that houses the swimming pool at Pacific Lutheran University in Parkland. TACOMA, Wash. — A baby was born on an elevator stuck between floors Wednesday at St. Joseph Medical Center in Tacoma. Blake Thacker entered the world early at 7 pounds, 15 ounces, just short of the 14th floor. The state Emergency Management Division activated its operations center at Camp Murray on Wednesday to help deal with the snowstorm. Spokesman Mark Clemens says cities and counties are handling the situation on their own, and there's been no request for state aid as of 8 a.m.
"Life is back to normal for two towns deeply buried in snow along Alaska's Prince William Sound," The Associated Press says. "The National Weather Service said Tuesday the weather is supposed to remain clear in both Valdez and Cordova this week." 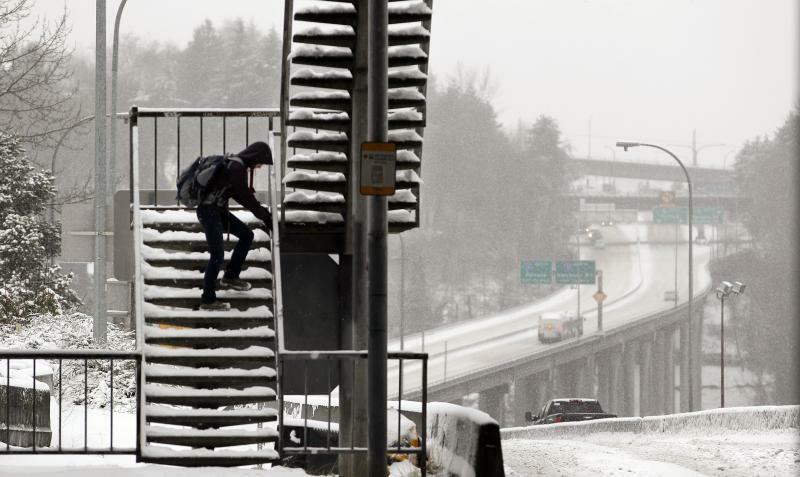 PORTLAND, Ore. — Western Oregon woke up to rain and slush instead of significant snow accumulations on Wednesday, but a storm that moved in overnight left thousands without power. The winter weather brought 2 to 4 inches of snow to the region overnight, but temperatures warmed and it changed to rain, leaving a slushy mix on roads and trees. During the last major snow storm in the Seattle area, in 2008, Metro Transit came in for a lot of criticism. Busses slid out of control on icy streets or got stuck in the snow. This time, the transit agency has new plans it hopes will result in better bus service. For complete details, go to the King County Metro Transit website.